I spoke about shamanism and my practice at a University for Chinese Medicine about a year ago, and one of the students who felt a very strong resonance inquired about scheduling a session. As time passed, I did not hear from her and wondered, but she kept studying my website and trying to decide when she would schedule. Then just a few weeks ago, something extraordinary happened. You see, for some time she had been teaching her Qigong students that it is not necessary to follow a lineage. Something within her felt very strongly about learning directly from the Source. This is one of the differentiations between the shamanic approach and some spiritual traditions as well. In the shamanic teachings, there is a “lineage” of shamans and students, and/or ancestral initiation, but no hierarchy. The teacher facilitates the student’s own direct connection to Source, then becomes part of the team of equal allies for the student’s work, and the student is allowed and encouraged to go well beyond those who came before them, and so on. Some time during the year, my client fell into what is known as a “dark night of the soul”, where everything seems to collapse into a seemingly endless abyss – physical and emotional health, relationships, work, motivation, desire to live, all collapses to a point where death seems immanent. This is a classic archetypical part of the original shaman’s journey, or hero’s journey as it is also known. When we are in the shaman’s training through the Four Winds Healing the Light Body school, a similar diving into the abyss, death and rebirth, is integrated into the process, but in a way that is ideally more gentle and easily understood with tools to make it through as gracefully as possible over a typical year or two period . Students there over the years have experienced this in varying degrees of intensity. As she was in the deepest part of the this process, her husband was synchronistically and ideally away on a business trip, and her teenage daughters were around. My client began to get urges and ideas/instructions to go through some relatively strange rituals, and engaged her daughters to gather what was needed. They of course, were annoyed at these strange requests and their mother’s strange behavior, but went along assuming she was just going through a temporary physical illness of sorts. This was a similar scenario that my northern Native American teacher went through. This went on until several weeks ago, when she emailed me to schedule a session. Soon after sending the email, she began to feel better and get messages in her dreams with new ways and techniques to conduct her own healing practice, truly breaking away from previous restrictions placed upon her from earlier hierarchical teachers. I will leave it to my client to share her complete story and details of this truly rare occurrence, but when she shared this with me in session the other day, I could see in awe that everything she did and all of the information, wisdom, and techniques for her own healing practice that came into her head, were essentially identical to the entire core Four Winds HLB training, which is the most comprehensive such training that I know of. She used a different vocabulary, but I could easily translate. I even had her work on me on the spot, to track what she had learned, and her work was extremely powerful. 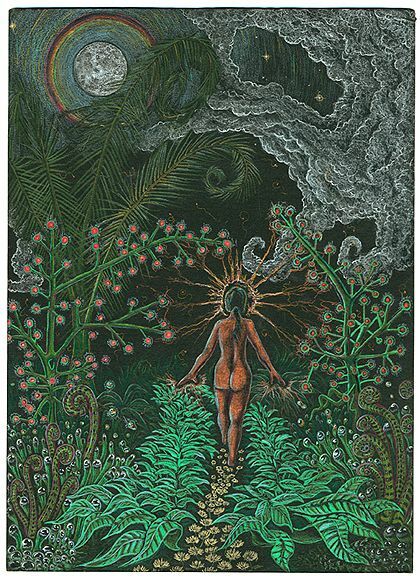 Mind you, in a classical shamanic way since childhood she felt different and spent her life pursuing her spiritual and healing urges; and had significant training in various modalities and many personal transformations. So the foundation was set for the leap she was now experiencing. So I was blessed to witness the most quintessential age-old direct shamanic initiation of what I may even consider to be a new “lineage” of her newly learned techniques combined with all of her previous training. After coming out of the other end of this intense healer’s journey, everyone who knows her noticed and commented on how completely different she looked – and at least fifteen years younger. This also regularly happens with Four Winds students. Whether fully conscious of it or not, she was asking for this, and she got it – ready or not. My teacher Alberto as I mention in my book Dreaming Your World Into Being, refers to this as when you begin to stalk power, it stalks you; and, it doesn’t care whether or not you’ve had your coffee and shower. To me, this a testament to how alive these traditions are today as ever in our records of legend and lore, and how powerful it is to ask with great emotion and then non-attachment for your gifts to be fully revealed and received. There is always the mystery of the unknown and unknowable, but I suspect that the eager and powerful allies of my shamanic medicine may have played a part of answering this asking as they often do. This was simply the most extreme and rare scenario of this kind of intervention that I have been witness to in this life so far. And I also suspect that this experience came to me through this client, since I had recently shared on Facebook a couple of other new and rare experiences related to my work that left a powerful impression. So let’s see what’s next! Thank you Universe for raising the level of awe!